This article helps you understand how to make a new reservation and walks you through all the required steps. The “New Reservation” button is located on the top right of the reservation page under the Car Rental category. A completed reservation consists of NINE steps with an additional tenth step that allows an administrator to overwrite the calculation, should that be required. 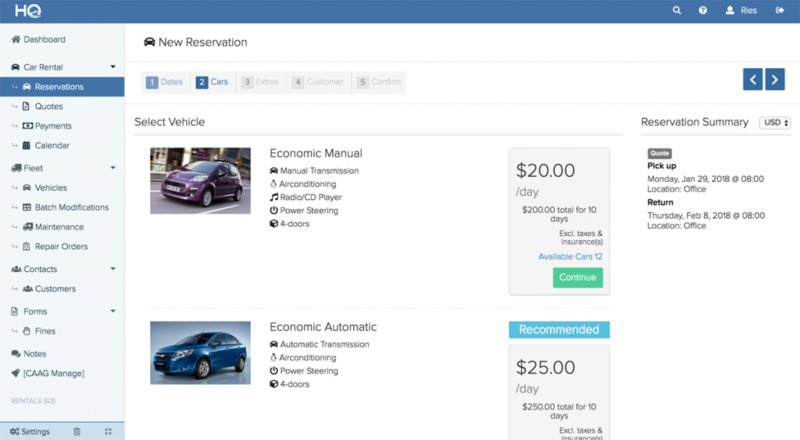 The first 5 steps can be filled out by the customer on the car rental website or internally. Steps 6-8 are carried out when the customer comes to pick up the vehicle. Lastly, step 9 is carried out when the customer comes to return the vehicle. This is the period of the rental. 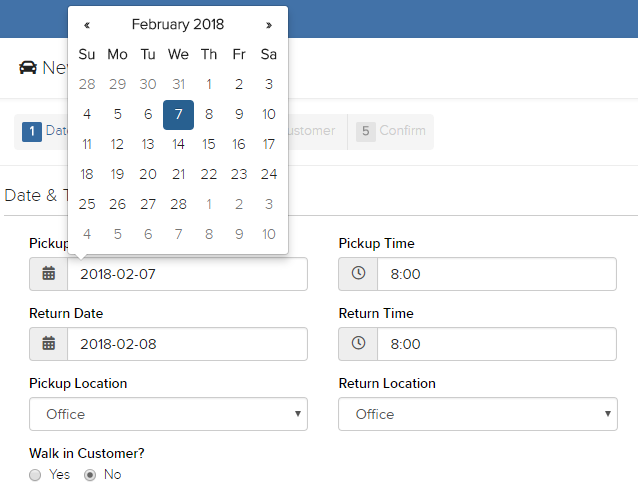 The calendar picker as shown in the picture helps the customer to select the dates. 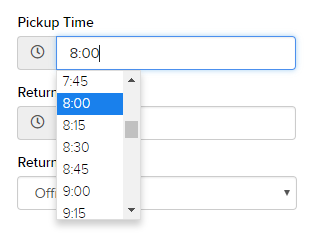 The time can be selected from a dropdown list as shown in the picture below. The time between the intervals is 15 minutes. When you first entered your fleet into the system, you created vehicle classes. These vehicle classes determine the different type of rates. This step will show all the different vehicle classes as well as any other details of the classes that you have entered into the system. This step showcases all the additional services that your company provides that you have keyed into the system such as Child Seat or GPS. This step is also where a customer can add in any additional insurance or coverage that you provide such as the Collision Damage Waiver. The customer can select more than one item in this step. A customer can also enter a discount code or you can manually enter a discount for the customer in this step. This step allows for an easier process for a returning customer as they can search for their information. If it is a new customer, they can manually add their details. This customer form can be edited to suit your needs, to learn how to do so, click here. The step which customers can review what they have chosen over the last 4 steps. Customers can also choose to either confirm the reservation or they can get a quote which they can easily compare prices from. Depending on how your company has set the payment gateways and the rules, this step helps to navigate payment either through cash or an online gateway that you have integrated. By default, the system will not allow you to give out a vehicle without a full payment. You can change this in the settings. Click the light blue “Assign Vehicle” button, highlighted in orange. 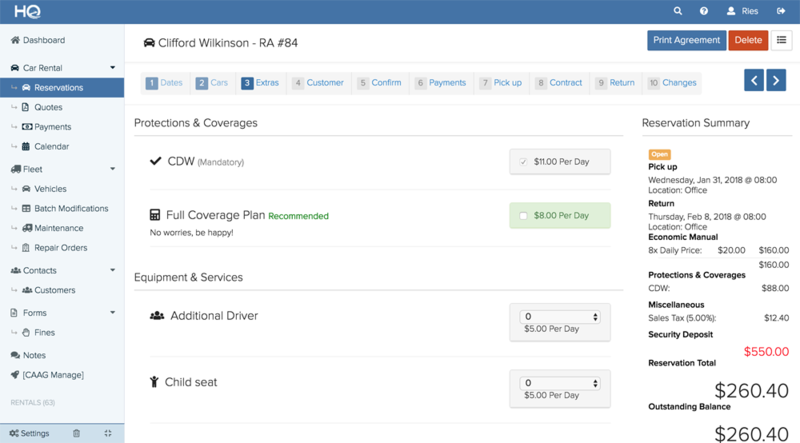 Select a vehicle from the dropdown list, highlighted in light blue. The “Recalculate rates on Late Pickup” is when you want the system to recalculate the rates if a customer picks up the vehicle late. The rates that the system will use is what you have input in the vehicle class. This step automatically creates a rental agreement for your company that your customer can sign digitally. You can also add in additional terms and conditions to your rental agreement and change how you would like the rental agreement to look like in the settings. By default, the system will require you to key in the odometer value of the rented vehicle. You cannot proceed with closing the reservation unless the customer has paid in full. The “Recalculate rates on early Return” is when you want the system to recalculate the rates if a customer returns the vehicle early. The rates that the system will use is what you have input in the vehicle class. This is an additional step that is included to help you overwrite any fee changes that are needed to make adjustments. Only do this step if it is really necessary. To learn how to cancel a reservation, click on this link here. For more information about deleting a reservation, click on this link here.